National Democratic Alliance presidential nominee Ram Nath Kovind on Sunday met with members of Parliament and state legislators of the Bharatiya Janata Party and its allies from Uttar Pradesh, kick-starting his nationwide tour from his home state to seek support from various political parties. Accompanied by Union minister Nitin Gadkari and BJP national general secretary Bhupender Yadav, Kovind drove straight to Chief Minister Yogi Adityanath's official residence from the airport. Adityanath and other senior BJP leaders and ministers earlier received 71-year-old Kovind at the airport in Lucknow. At the CM's residence on the Kalidas Marg, he interacted with a host of senior party leaders including Union ministers Uma Bharti and Gadkari, Deputy Chief Ministers Keshav Prasad Maurya and Dinesh Sharma. He also met with UP Assembly Speaker Hriday Narayan Dixit. Addressing the MPs and state legislators, Adityanath said, "It is for the first time that we will have the honour of having a person from Uttar Pradesh as our president. This honour has been bestowed upon by Prime Minister Narendra Modi and BJP chief Amit Shah." "It will be good, if all the political parties rise above the narrow party lines and vote for him. It will send a good message," the chief minister said. He said that Kovind has led a simple life and that he has been working continuously for uplift of the poor, the Dalits and the marginalised section of the society. At the meeting, Gadkari also explained as to how to cast the ballot. 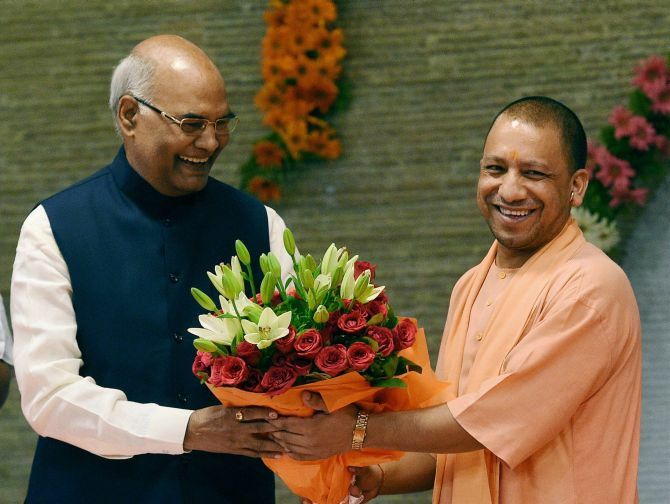 Though Uttar Pradesh has given the nation a number of prime ministers, it will be for the first time that the politically-crucial state will have the pride of sending someone to Rashtrapati Bhavan if Kovind is elected. The closest the state came to having its representative in the President's House was in 1969, when Mohammad Hidaytullah became the first Acting President of India from July 20, 1969 to August 24, 1969. Sakshi Maharaj, the BJP MP from Unnao adjoining Kanpur from where Kovind hails, was also present. Bhupender Yadav, Kovind's authorised representative for the presidential poll, said he has come to Lucknow to seek support from the members the electoral college. He will now visit other states, Yadav said. BJP sources said a Union minister, a senior organisation leader from the party and two MPs will accompany Kovind during his nationwide tour to reach out to all members of the electoral college. Though his meeting will be with the supporting MPs and MLAs, Kovind will make an appeal to all the members of the electoral college in every state to support him. Opposition parties have fielded former Lok Sabha Speaker Meira Kumar, a Dalit leader, against Kovind. With over 62 per cent of votes firmly behind him, Kovind's election as the next president is almost certain. The presidential election is scheduled for July 17 and the counting of votes will take place on July 20. While Kovind filed his nomination papers in presence of Prime Minister Narendra Modi and NDA chief ministers in New Delhi on June 23, Kumar is yet to file hers. Kovind, if elected, will be the second from the Dalit community to occupy the highest constitutional office, the first being K R Narayanan.